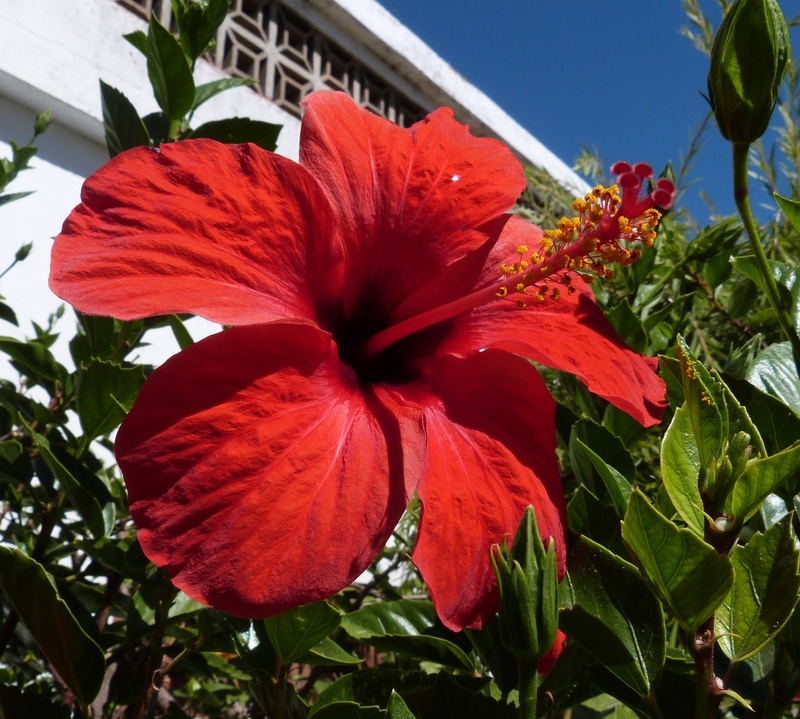 Todays Thank you Thursday goes to Piglet in Portugal and her other blog Piglets Plot for her instructions on how to propagate Hibiscus. I have tried and tried to grow this beautiful shrub but to no avail. My soil is a very heavy clay and I think they might be able to make terracotta roof tiles with it. 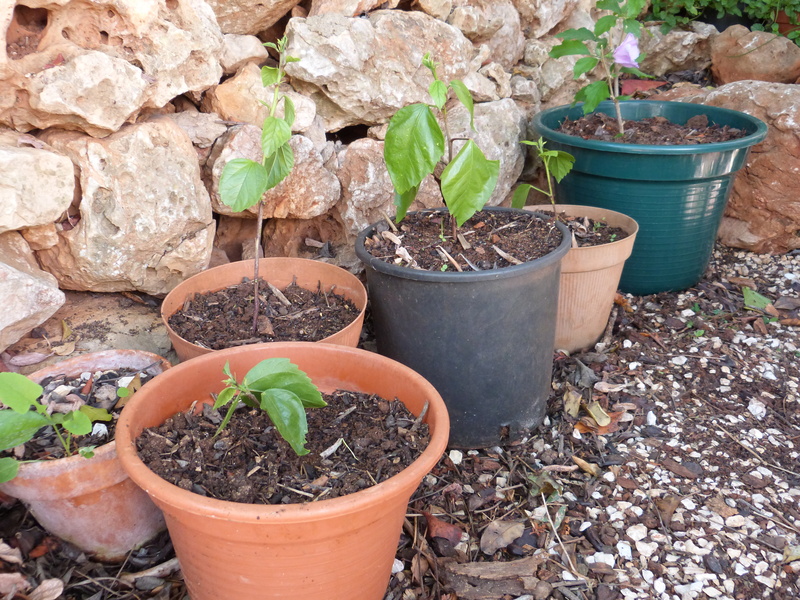 However on seeing the words sandy soil in Piglet’s post I realised just what was going wrong with my poor attempts to grow Hibiscus. Right I said to myself, make some sandy compost with some builder’s sharp sand that has been left out for several years, so should have returned to pure sand, some soil from under one of our carob trees and some compost made with chicken poo, straw, weeds and the kitchen scraps that the chickens don’t eat. A flower from the mother plant. on this, but the splash of bright red that meets our eyes when we round the corner towards her house is always a welcome sight. After reading Piglet’s post I asked my neighbour if I could have a cutting, being very generous she gave me four. Her instructions were somewhat different from Piglets, she told me to put the cuttings in water for eight days before planting them out directly into the ground. OK I thought four cuttings and two different methods so two cuttings were put directly into the soil/compost/sand as per Piglet’s instructions and the other two were put into water. 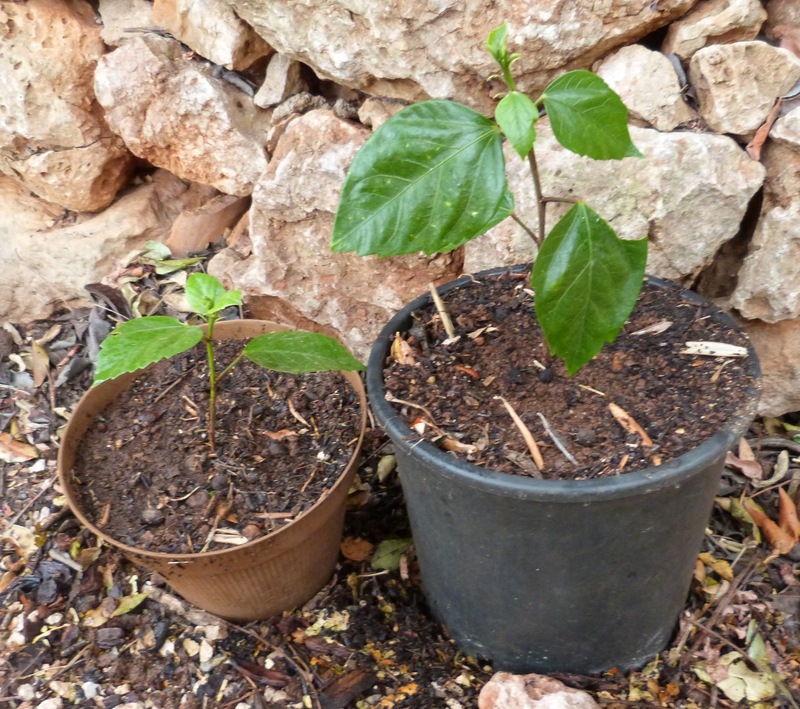 After a week I have to say that the cuttings, Piglet’s way, seem to be doing rather better although I’m pleased to say that the other two cuttings do seem to have picked up somewhat since they have been potted up. I didn’t put them into the ground as my neighbour said because I didn’t think they would do anything and I did want to give them a chance. I’ll let you know how the four cuttings do and I just wanted to give Piglet a humongous THANK YOU for sharing her knowledge on not only this subject but an all the other information she blogs about. Pop over to her blog to see what I mean. I’ve decided to post a special thank you every Thursday, and dedicate it to a blogger who may have made me laugh, cry, instructed me, updated me, entertained me, shown me beautiful photographs, sketches, poems, oh the list goes thankfully on and on. So if you want to be part of this great thank in, just publish a Thank you Thursday post about some amazing blogger to your post and tag it Thank you Thursday, together I’m sure in time all the bloggers will get a special mention. If you don’t want to join in this extravaganza then I’m sending a huge THANK YOU to you for taking the trouble to read this post. Aww thanks for the mention 🙂 Thank you Thursday – what a lovely idea! Thanks for the advice when I planted them it was raining so I didn’t do that, they are now sitting in a tray of water which I keep topped up. Once again my thanks for your information. What a post! For all the the lovers of plants, flowers and sunshine, you are a breath of fresh air! Thank you but it’s really Piglet in Portugal that should get the credit. Fingers crossed for some Little Baby Blooms in due course ! Oh yes I do hope so. I just love the flowers.